Cryptanalysis denotes the study of analyzing information systems for studying the hidden aspects of the systems. Cryptanalysis studies the cipher text, ciphers and even cryptosystems, which is the process of secret code systems in order to find out weaknesses in them that would allow retrieval of the plain text from the cipher text without inevitably knowing the algorithm or the key. Cryptanalysis enables you to gain access to the contents of encrypted messages whether the cryptographic key is unidentified. Cryptographic algorithms can be mathematically analyzed and cryptanalysis also includes the study of side-channel attacks which do not target weaknesses in the cryptographic algorithms on their own but rather exploit weaknesses in their implementation. There is a drastic change in the methods and techniques used in cryptanalysis as compared to the methods used earlier. There has been a vast development in the complexities in crypto analysis with an increasing use of mathematically advanced computerized schemes at present. In today’s time, the processes for breaking modern cryptosystems contains solving carefully created problems. Academic attacks are often against a weak cryptosystem. It is possible for the whole cryptosystem to be strong even though the execution is difficult as more rounds are added to the cryptosystem and this is possible even when the reduced round variants are weak. 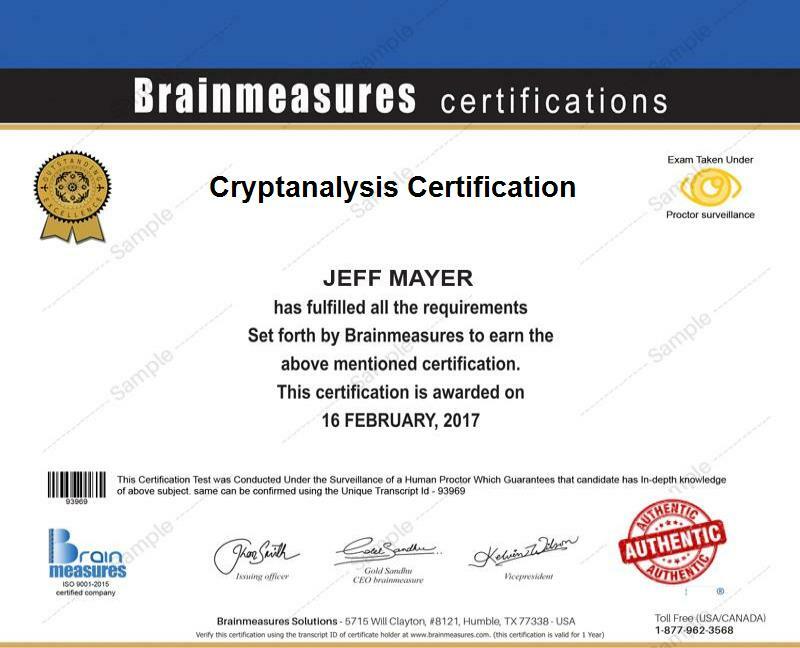 The Cryptanalysis certification course by Brainmeasures is explained well in detail and all the significant aspects of the course have been covered well in this extensive course. Cryptanalysis deals with basically taking the encrypted information and trying to decrypt it without the key. Cryptanalysis plays a very significant role in military intelligence and diplomatic intelligence. The established dedicated organizations devote their time in breaking ciphers of other nations actively. Cryptanalysis has its own advantages in security and other confidential matters of some organizations. Brainmeasures is an ISO certified leading online professional certification company renowned for their professional certifications and skill testing. After getting enrolled in this course, you would receive an E-book that would guide you for the online exam. Upon successful completion of the exam, you would be awarded the certification by Brainmeasures. This course would prove advantageous for individuals involved in working with programming and codes. The average salary of a Cryptographer is around $90,435. Salaries vary depending upon personal experience and qualification of an individual. Gives you the general information about Cryptanalysis. Discusses about the concealment devices. Explains the geometric types explaining through: The Nihilist Transposition. Discusses the geometrical types: The Turning Grille. Discusses the irregular types: columnar transposition. Discusses the general methods and multiple anagramming and more. Discusses the substitution types and its fundamentals. Discusses the consonant line short-cut, a process for attacking difficult cases. Explains about simple substitution with complexities. Explains about multiple alphabet ciphers. Explains about the Gronsfeld, Porta and Beaufort Ciphers. Explains about the Kasiski method for periodic ciphers. Explains the miscellaneous phases of Vigenere-Decryptment. Explains about Auto encipherment and some periodic number ciphers. Explains about product ciphers with mixed alphabets. Explains about polyalphabetic encipherment applied by groups. Explains about Vigenere with key progression and polygram substitution. Discusses about highlights of fractional substitution. How to investigate the unknown cipher. The Cryptanalysis certification course by Brainmeasures would be beneficial for individuals involved in coding and programming systems. There are a number of organizations where cryptanalysis is used and even government organizations make use of cryptanalysis. Certifications by Brainmeasures are accepted and recognized worldwide and are of a high value. The chances of getting recruited increase considerably if one has proper qualification and certifications from a reputed and established institution and Brainmeasures is one of the best reputed and well known online professional certification company.